We set out to answer the second most-popular question submitted to Ask Project Homeless. It sounds simple, but it's not, because different people need — and will accept — different services. Here are some of the dollar figures. What would it cost to help each homeless person? That’s what Matt Senft wants to know. The Sammamish software professional has been hearing for a while — from people at City Hall and in the media — that Seattle and King County need more money for homeless services and for affordable housing. Then, last week, billionaire Jeff Bezos announced he’d be donating about 1.2 percent of his current wealth to nonprofits helping homeless families, as well as to create nonprofit schools in poor communities. It’s unclear if that $2 billion will be spent in King County, but if it were, could it fix family homelessness? 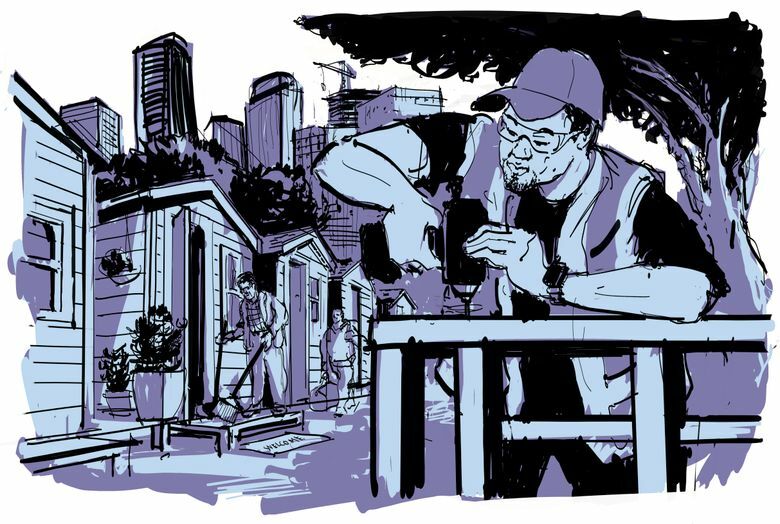 What would it take to fix all homelessness? It’s a number Seattle leadership has struggled with — one that generated controversy during Seattle’s head tax debate, and when consulting firm McKinsey & Company tried to calculate how short the region was on affordable housing. We put it up for a vote, and it got over 1,600 votes — our second most popular, behind the one we answered last week, about police enforcement of tent camps. “Everybody wants to help everybody, but at some point — are we really spending our money wisely?” Senft said. Most people who were living outside get inside through emergency shelter; about two-thirds of the entries in the homeless information database in King County were for shelter, according to the Commerce data. But King County has been emphasizing rapid rehousing and moving away from transitional housing. So there is no easy way of getting to a bottom-line number to get people housed. … to provide drug use treatment? Treatment at a clinic, including a replacement drug like methadone, costs $6,577 for a year. Another route to sobriety could be a three-day stay at a detox facility, which costs $985, followed by inpatient treatment ($3,640 for 14 days); then outpatient treatment ($3,674 for a year). The minimum cost for that route would be $8,300 a year. … to provide mental-health treatment? A stay at a mental-health evaluation and treatment facility in King County costs almost a thousand dollars a day. After 14 days, if that person still needs intensive treatment, he or she is supposed to be transferred for longer-term care at Western State Hospital (if there is room). A year of outpatient office visits costs $3,840; if someone is struggling with very serious mental illness, it might require a 14-day stay at a county evaluation and treatment facility, which is $13,300. Some who have more serious mental illness will need both; for them, the cost for a year of treatment could be $17,140. 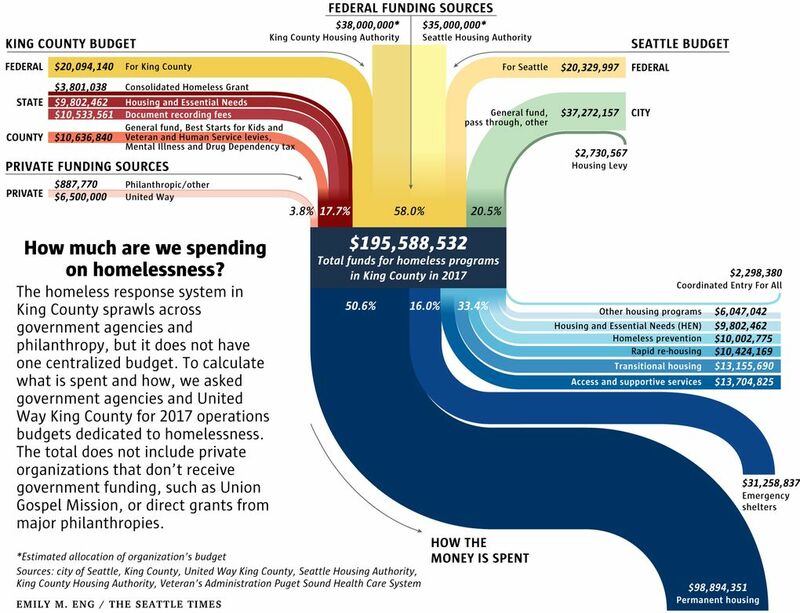 Senft wanted to know not just what it costs to help one person, but what it would cost to help everyone, so The Seattle Times tried to find a bottom-line estimate. Unfortunately, the data currently available aren’t sufficient to do that. It’s important to note that people’s need for services varies widely. Some people need far more help to become healthy and housed. And it is possible — even likely — unsheltered people struggling with substance use or mental illness are already getting some type of help. Actually there about 30,000 people a year who request an array of homeless services in King County. Not all of them are unsheltered or need mental-health or substance-abuse treatment, so Senft’s question wouldn’t apply to them. Even if local government spent thousands to get each person inside, there are not enough affordable housing units for those people to go into, according to Zylstra. A real bottom-line estimate would need to include the cost to build units, she said. Jim Vollendroff, who runs the county’s behavioral-health division, didn’t feel comfortable estimating the cost to provide treatment for everyone in the one-night count who said they had mental-health or substance-abuse issues. Their hesitation reveals this: There is no countywide gap analysis to answer Senft’s question, even though Seattle and King County are nearly three years into a declared state of emergency on homelessness. Zylstra said that for the time being, the McKinsey report is the most accurate estimate relying on official data. The McKinsey report said King County would need to spend $410 million a year on building affordable housing to fix the problem. Senft asked a direct, simple question, but the answers are anything but simple. When Senft heard about the lack of a gap analysis, he wondered if King County could even solve the problem without knowing.